Embrace Space! : From Then to Now: Celebrating 6 Years in Space and This Blog! A few weeks ago, I noticed that my total page-views was nearing the 100,000 mark, and I thought to myself, "That's great! I'll have to write something about that!" and then I blinked, a week went by, and now we're over 102,000! The pace of readership, or at least viewership, has been increasing in the last few years, and I am very happy about that! Seriously, I am thankful, honoured, and appreciative of the time and effort involved with coming back here, and checking out my posts. I've worked to keep things interesting, passing up quantity for quality, and I hope you have found this to be an entertaining and informative place to convene on the Internet. So, to honour all of this, I want to acknowledge how far we've come since this blog was made. My first blog post, entitled "Welcome", was published on August 17th, 2011. Little more than a paragraph, it introduced the blog, directed readers to the "About this site" page, and began categorizing topics by the labels on the left. Since then, I've published 259 posts (this one included), had 102,541 page-views, officially named the blog "Embrace Space", added links to Twitter, other blogs I frequent, and other content I've begun making. Frequent followers of my work know how far I personally have come since 2011; from an undergraduate student to completing my Masters degree, to employed and living in France, but how far has the space industry come? That's what I want to talk about now. The Space Shuttle program officially ended in July of 2011, with the Atlantis delivering equipment to the International Space Station (ISS). The program had run for 30 years, with 134 launches, 2 very unfortunate accidents, and was an important element in the ISS' construction and continued operation. The Shuttle was a beast, able to carry 27,500 kg (60,600 lbs) to low-Earth orbit, via 12,500 kN (2.8 million lbf) from each solid booster, and 5,250 kN (or 1.18 million lbf) from the Shuttle itself. Despite what you may have seen in movies, the Shuttle was not able to break Earth orbit, and was designed only for frequent trips to orbit. However, maintenance costs were high and by 2011, the program was scrapped. The Soviet Union had developed their own version of the Shuttle, known as the Buran; sadly, it only flew once in an unmanned test in 1988 before its program was cancelled, but I did get to see it, in Moscow in 2014! Since 2011, the USA has not had a way to send a person into space (unless we count suborbital programs such as Virgin Galactic and the Ansari X Prize) and has had to rely on Russia's Soyuz. China remains the only other nation capable of sending humans to space, but so far, they've kept that technology to themselves. Shifting away from human space exploration, let's take a look at robotic probes. It has been a busy 6 years for robots, with successful missions all throughout the Solar System! For more reading/sources, please check out this timeline and this page! These probes have provided updated and higher-resolution telemetry, allowing us to better understand planetary formation, the history of our Solar System, and aided in the development of new and exciting technologies! Since 2011, we've orbited Mercury, dwarf planets in the Asteroid Belt, reached interstellar space, landed on a comet, retrieved asteroid material, and flown by Pluto, all while studying each place we reach with incredible detail. The clarity, the resolution, with which we have seen space has increased incredibly; note the difference in how we see Pluto now vs before the New Horizons' flyby! We've expanded our view past the Solar System as well, discovering exoplanets and planetary systems with remarkable pace. 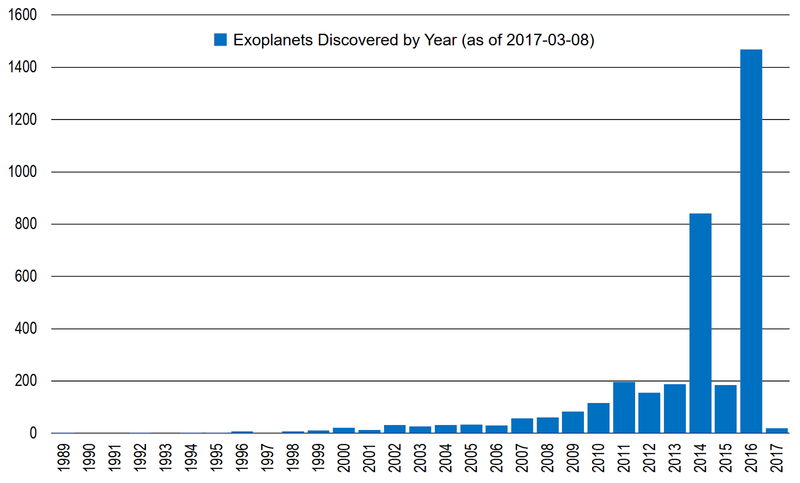 Since 2011, we have discovered over 3,000 exoplanets, in 2,700 planetary systems, using techniques such as radial velocity, transmit, and microlensing. If you want to learn more, please check out this cool, interactive, animation! And here, where you can learn more about each exoplanet! The collaboration necessary and involved in each mission has allowed new technology to be developed to cut costs and improve space operations right here in Earth orbit. New, high-performing satellites have been developed, globally serving us through a variety of applications. Earth observation, satellite telecommunication, satellite manufacture/launch, all provide opportunities, including the cost-savings via usage of space assets for everyday business, as well as the billions of dollars in market growth since 2011. Since this blog started, humanity has launched almost 500 commercial and telecommunications satellites, almost 90 crew and cargo missions to the ISS, and improvements in technology and operational practices have kept the smallsat revolution going, with over 700 sub-100kg satellites launched! The success of the satellite industry, and of human/robotic space exploration, relies on rockets, and we've definitely made some amazing progress here. In 2015, Blue Origin was the first to land the first stage of a rocket back on Earth, landing after a 100km altitude flight. SpaceX, which had been trying something similar, only on water, has since landed their Falcon 9 on both water and land, and even re-launched a previously-landed first stage! Now, the case has yet to be made, conclusively, that landing and re-launching rocket stages will actually bring about cost savings (remember, that was the intention of the Space Shuttle, whose maintenance costs ended up shutting down the program), but these achievements have definitely made improvements on the way rockets are launched and operated. Each milestone is a step forward toward a more space-normal future. We have come a long way in the last 6 years, and I've only focused on some of the more highlight-worthy material. There have been advances in many fields, all helping us push out there and explore the final frontier. Sound a little too "inspirational"? Well, just consider the amount of business that has transpired, and how satellites help us understand the Earth and our assets better, bringing about cost-savings and operational improvements. It has been an exciting time, and while things down here on the ground have looked very rough lately, just know that we have done great things before, and we will do so again, but only together. Thank you very much for reading this and other posts on my blog. I sincerely hope that you've enjoyed yourself, learned something, and I aim to bring you more interesting adventures on the days ahead. As always, should you have any comments, suggestions, or similar, please post them below; I always value criticism, if used constructively. Also, please forward and share this with others who you may think are interested, I'm always looking for more ways to connect with more people, learn from their experience, and maybe even highlight their journey right here. Thanks again, I'll see you soon, here on Embrace Space!